Becoming a homeowner can be a terrifying proposition for first-time buyers. With so many entry barriers and intricate details to know before buying, it can seem like you’ll never be able to find the right house to suit your needs. 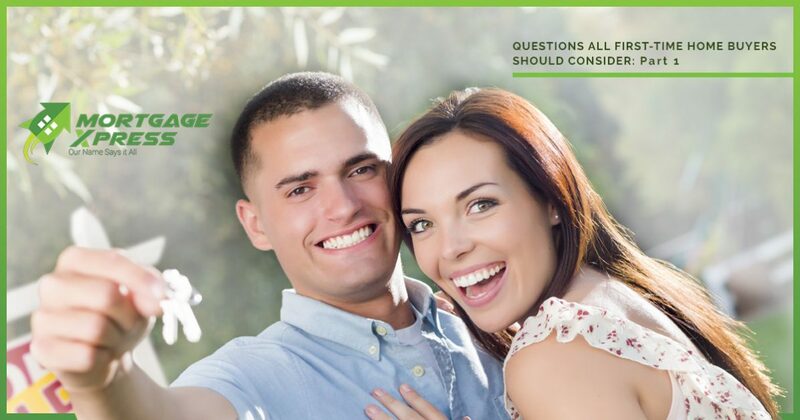 That’s why Mortgage Xpress has compiled a list of questions first-time homeowners should consider before moving forward with their purchasing decision. In part one of our multi-part series, we’ll shed light on three basic questions you should ask yourself during the initial stages of looking for a home, so that you don’t make a hasty decision that you may later regret. The question of whether or not you should purchase your first home through a real estate agent boils down to how much time you’re willing to invest in your search for the perfect home. If you’re dedicated to finding your dream home on your own with minimal guidance, keep in mind that you’ll be dealing directly with the seller or the seller’s agent which will require you to negotiate prices, sign legally binding papers, and close the final deal all on your own. While a real estate agent is not necessary in purchasing a home, finding the right agent for your needs could protect you from signing a document containing fine print which you normally wouldn’t agree to. According to NerdWallet, a standard rule of thumb for determining how much house you can afford is to not exceed your monthly expenses by 45%. NerdWallet states that, “the 45% rule is based on dividing your monthly mortgage payments and other monthly debt payments by your gross monthly income.” This doesn’t necessarily mean that you should purchase a house if you can afford it. If you can barely afford your house payments, and don’t take unseen setbacks into account before purchasing, there may come a time where it becomes extremely difficult to make your monthly payments, causing hardships and unneeded stress in your life. Which Location Is Right for Me? When first-time home buyers search for their dream home, it is important to keep location in mind. While a trendy house or loft in the city may sound like an appealing buy right now, it might not suit your needs in the future. It is imperative that first-time home buyers think long term when purchasing their ideal home. For instance, if you plan on having a family in the not so distant future, you may want to consider a quieter area located in a reputable neighborhood that is closer to good schools and safe playgrounds. Buying for the future can save you a lot of time and effort, as opposed to making an uninformed decision and feeling stuck if your lifestyle changes later on. If you’re a first-time homebuyer in Birmingham and surrounding areas, and are looking for a lender with a longstanding reputation and affordable rates, contact Mortgage Xpress today. Our incredibly experienced lenders at Mortgage Xpress have helped countless individuals afford their dream home for over 30 years.